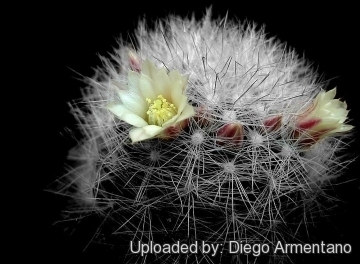 Origin and Habitat: Mammillaria schwarzii is endemic to Guanajuato, Mexico. It is only found in one location near San Felipe on a steep volcanic rock face about 100 m (plan view) by 4 km long. The extent of occurrence is less than 100 km2. Altitude range: It grows at altitudes between 2,150 and 2,400 metres above sea level. Habitat and Ecology: This cactus grows on cliffs and steep volcanic rock (igneous) in soil pockets in semi-desert (matorral) and oak forest. This species is highly threatened by illegal collecting. The locality is a standard stop for cactus tour groups from Europe and is now well-known to both commercial and amateur collectors. Current estimated population size is less than 1,000 individuals. 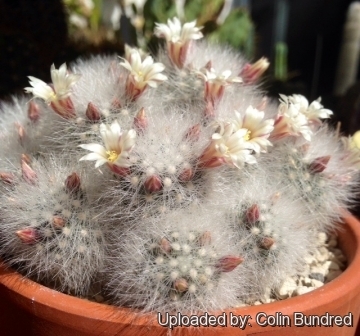 Description: Mammillaria schwarzii is densely covered with thin, glassy white spines, easily broken. It clusters densely from an early age, making man's-fist sized clumps without much trouble, but it is rarely seen much bigger than this. The small, pale cream-coloured flowers are followed by masses of bright red fruits that contrast nicely with the whitish spination. Stems: Stems globose, to 3 cm high and 3.5 cm in diameter. Without latex. Tubercles: Cylindrical. Axil with up to 12 thin white bristles c. 5 mm long. Radial spines: 35-40, hairlike, shiny white. Central spines: 8-9 very similar to radials, white with darker tips, 5-6 mm long, one erect, others surrounding it. Some plants seen in cultivation have occasional hooked central spines, and these plants are very often those with reddish tinge to the tips of the spines, as though a red-ochre brush has been lightly passed over the plant - a very handsome variation. Flower: Predominantly white and smallish (about 12 mm in diameter) with red or pink midstripes to the petals, to 5 mm long. 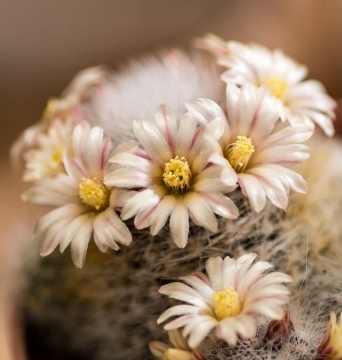 Taxonomy note: Note that in the name Mammillaria schwarzii Shurly there is no a 'T' as in Porfiria schwartzii Frič) K.Crkal (syn: Mammillaria schwartzii (Frič) Backeb. 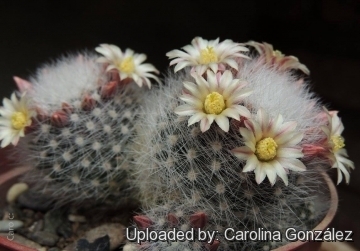 ), now more generally known as Mammillaria coahuilensis (Boed.) R.Moran, in spite of Backeberg's acceptance of the confusing homonym. 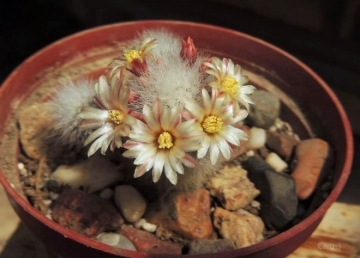 Buxbaum has in all his writings, it seems, confused Porfiria schwartzii with Mammillaria schwarzii and has also published a series of nomenclatural howlers in a series of contributions on Porfiria to 'Die Kakteen' The chief point (which the late Mr. Shurly made with some heat and confusion in Journ. Cact. Succ. Soc. Great Britain 23:58. 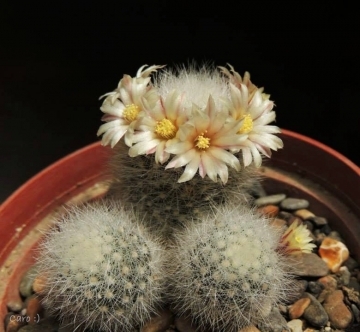 1961) is that Moran's decision to treat Porfiria as a subgenus of Mammillaria, which Buxbaum himself later accepted, was based on Buxbaum's erroneous concept of Porfiria schwartzii which seems to have included M. schwartzii Shurly and Porfiria schwartzii var. albiflora (Boed.) 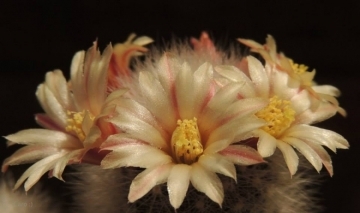 Berger (which may be Mammillaria albiarmata) as well as the true P. schwartzii or descriptions of it. 5) Sánchez , E., Fitz Maurice, W.A., Fitz Maurice, B & Bárcenas Luna, R. 2013. 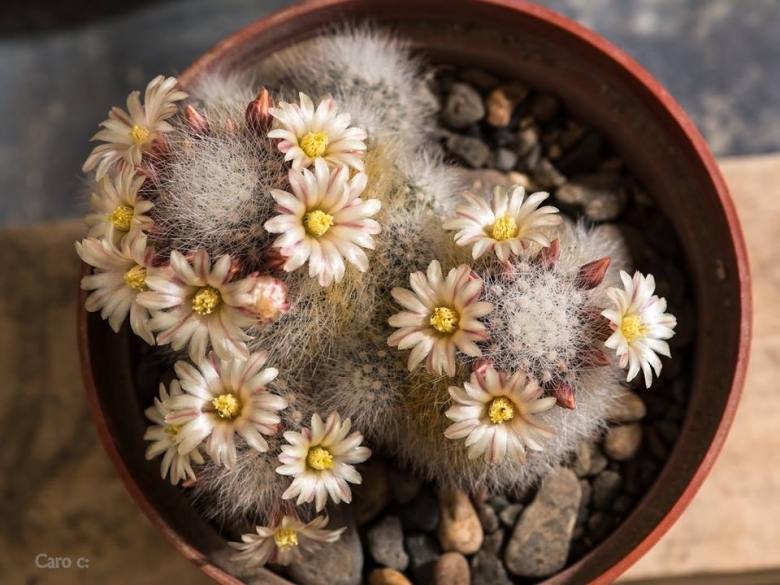 Mammillaria schwarzii. The IUCN Red List of Threatened Species. Version 2014.3. <www.iucnredlist.org>. Downloaded on 15 May 2015. Waterings: It requires careful watering (rot sensitive), and patience to match its slow growth. 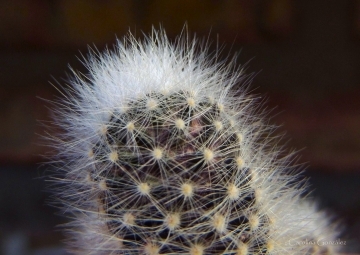 Care with overhead watering is needed, as the spines will trap water. Extra gritty soil will provide the rapid drainage that is needed. Propagation: Direct sow after last frost or by offsets.